Companies continue to repurchase shares at a prodigious pace. According to S&P Dow Jones Indices, almost one-quarter of the S&P 500’s constituents have reduced their shares outstanding by at least 4% over the past year. Based on data provided by Bloomberg, the companies in the index reported spending $589 billion repurchasing shares over the past 12 months. Over the last three years, combined repurchases exceed $1.5 trillion. Share buybacks, is a topic we have discussed numerous times. We believe repurchasing shares can represent an appropriate allocation of capital when management thinks the shares are undervalued. However, in our experience, for most companies whether or not to repurchase shares is not a value-based decision. 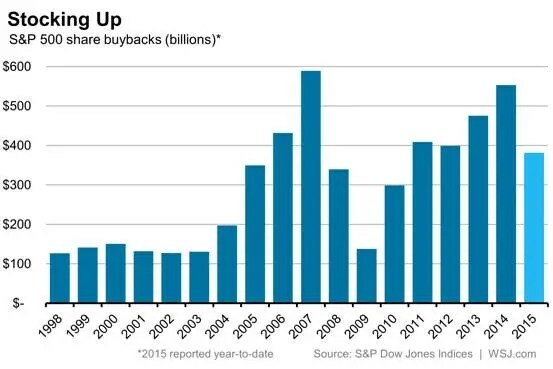 Buybacks are often touted as a means of returning cash to shareholders. In our view, if the shares are not undervalued, shareholders would be better off if management simply paid shareholders larger dividends. Because it also reduces the number of shares outstanding, stock repurchase activity can represent a form of financial engineering that boosts earnings per share even if a company’s overall income remains stagnant or falls. Importantly, many companies are both issuers and purchasers of common stock. Our analysis of data found in Bloomberg shows companies in the S&P 500 generated $157 million from issuing new shares over the last year (which is less than the $589 million in repurchases cited earlier). This would indicate that companies are repurchasing more shares than they are issuing. However, a recent study published by Research Affiliates (RA) questions whether or not companies are truly net buyers of their common stock. Based on RA’s study, U.S. companies issued $1.2 trillion of new stock last year alone. In sum, new share issuance sharply exceeded share repurchase activity. When management redeems stock options, new shares are issued to them, diluting other shareholders. A buyback is then announced that roughly matches the size of the option redemption. This facilitates management’s resale of the new stock they were issued in the option redemption. Buyback? Not really! Management compensation? Yes. For example, consider Cisco Systems’ share repurchase activity. In its fiscal year ending July 2002, Cisco started a share buyback program that has resulted in its cumulative repurchase of 4.4 million shares for $92.7 billion – an average price of $20.86 per share. On the surface, this sounds reasonable as the shares are currently trading for around $27.50 per share. However, at the end of July 2001 (the last year before the buyback program started), Cisco had 7.2 billion shares outstanding. At the end of its 2015 fiscal year ending July 25, 2015, the company’s diluted share count was 5.1 billion, a net decrease of 2.1 billion shares. In other words, while the company has repurchased 4.4 billion shares, 2.3 billion of these shares (4.4 – 2.1) effectively offset dilution. If we only consider the net change in shares outstanding, then Cisco spent about $45.20 ($92.7 / 2.1) for each net share repurchased. One of the most egregious examples of management using stock buybacks to compensate itself would be Dell. According to Floyd Norris of the New York Times, from 1998-2006, “Dell reported net income of $17.9 billion – and it spent $24.1 billion buying back stock. If you look at longer periods, the story gets even worse. From 1997-2013, when the company was taken private, Dell spent $39.7 billion repurchasing shares – more than the company reported in net income from 1987-2013. When reviewing companies that are held or that could be added to client portfolios, BWFA reviews compensation and the use of stock options as well as share buyback activity. These are all elements of management’s capital allocation policy. Effective capital allocation is an important element of our stock selection process. Please note that we will not be publishing a commentary next Monday due to the Thanksgiving holiday. We would like to wish all of our clients and friends that are reading this commentary (along with your families) a Happy Thanksgiving!